The origami-inspired building would inflate with help from a giant helium balloon. From telescopes to heart stents and artificial muscles, origami has inspired all sorts of curiously innovative objects. 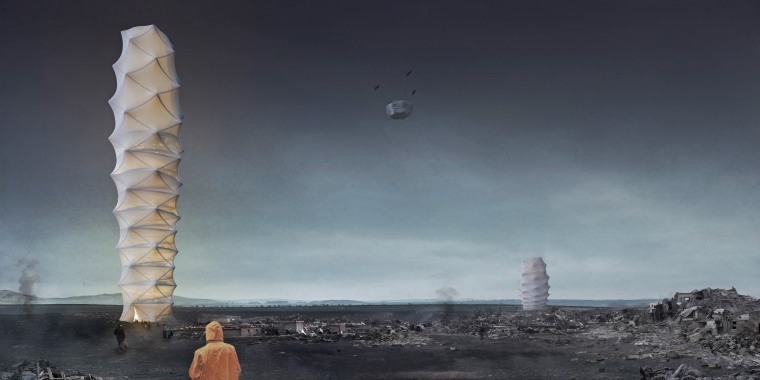 Now a trio of Polish designers has won a major design competition for their proposal for an origami-inspired skyscraper that could be transported to a building site in folded form and then unfolded to its full height with help from a huge, built-in helium balloon. The proposed tower might sound like something from the distant future, but it’s intended to address a problem of the here and now: providing shelter for people who have been displaced by earthquakes, hurricanes, and other disasters. The designers say the inflatable building, dubbed Skyshelter.zip, could be lowered into place by helicopter, moored to the ground, and then quickly erected. In addition to sheltering up to 1,000 people, the building could house a first-aid station and even a vertical farm that could help feed its residents. And the designers say that with its tiny footprint, the building would mostly eliminate the need to clear debris from large swaths of land — something that often must be done before large numbers of tents can be put up. The building’s walls would be made of ethylene tetrafluoroethylene (ETFE), a flexible plastic that can have built-in electricity-generating solar cells. Lightweight 3D-printed metal slabs attached crosswise to these gossamer sheets would serve as floors. Ramps between floors would allow residents to move about within the building. Skyshelter.zip would extend to a maximum height of 100 meters, but the height and number of stories could be adjusted to fit the need: more helium pumped into the balloon means a taller building and room for more people. There are no plans yet to build Skyshelter.zip, and not everyone is convinced such a structure makes sense. Ostap Rudakevych, a visiting associate professor of architecture at Pratt Institute in New York City, called Skyshelter.zip a “provocative vision” but said technical considerations might render it infeasible. Among these concerns are securing and transporting enough helium to lift the structure and ensuring that the balloon remains fully inflated over time. Americans have a nature problem. Is 'biophilic design' the solution? Pańczyk acknowledged the challenges of bringing Skyshelter.zip to life but is undeterred. “With current technology, building this structure would most likely prove to be impossible or extremely costly,” he told NBC News MACH in an email. “But we are sure it is only a matter of time as most technologies we use already exist or are being developed."